Welcome to our Uppsala Vandrarhem / Kvarntorget! We are located a 15 minute walk from the city centre in which you will find the largest Cathedral in northern Europe dating back to the 13th century and our Castle from the 16th century. Uppsala is a tranquil daytime alternative to the Capital Stockholm, with a delightful river-cut centre, and an active student-geared nightlife. 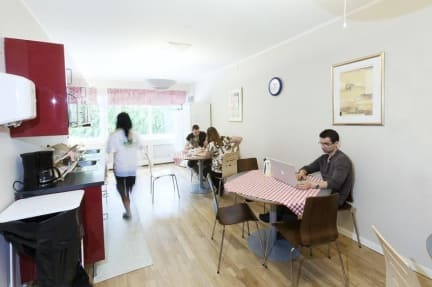 The hostel is located at walking distance from the bus- and railway station, from which you can reach Stockholm Arlanda international airport in 18 minutes and Stockholm in 40 minutes. The hostel is also easy to reach by car and there are parking lots right outside the hostel. In the hostel we have single rooms and twin rooms. In some of the rooms you can add an extra bed. Some rooms have a private wc/shower, otherwise access to common wc/showers in the corridor. Some rooms have windows facing Kvarntorget and a peaceful parking lot, some rooms have windows facing the interior atrium and a few rooms have no window at all. All private rooms are equipped with a tv and you can access our wireless internet free of charge in the entire building. Bed linen and final cleaning (on the day of departure) is always included in the price. Towels can be rented for 30 SEK. A breakfast buffet is served every morning in our atrium. Price: 75 SEK. This is kind of a barren, strange property in a strip-mall about 15 minutes walk from the centre or the train/bus station, However, it was quiet, comfortable and clean, although bathrooms were a bit smelly. The breakfast was a very good value with lots of fresh fruit in addition to the usual offerings of bred, cheese and cold cuts. Very comfortable bed. No hostel vibe. Everyone seemed to stay in their rooms most of the time. Wonderful, helpful, friendly staff. The breakfast @SEK75 was ok, especially for families. The water for the showers was uncomfortably cold and you had to keep pressing the button frequently. There were only 2 hangers in the closet in my room. Ben helped me learn how to use the induction stove top burners. Ali helped when I locked myself out of my room. Ben helped me learn how to use the induction stove top. Ipsitam, a shy Muslim woman who oversees the cleaning and breakfast, made me feel at home. It was very dirty and hard to use facilities including the beds, the kitchen and the toilet. It looks like they are not supervised regularly. Too expensive for such service.